Another week gone and I near forgot today to update lol, time sure is flying by. I don’t seem to have a lot of progress to show for my week and yet I cant say why not lol. Perhaps its the late hour or perhaps I just got caught up with other things this week lol. I did start the Gryffindor scarf, as this scarf over the others is so recognisable I’m trying to keep this one quiet. Here is the progress so far. I’m really liking the red and yellow combination on this one. Someone asked me last week what I used the dishcloths for, well for absolutely everything. They are great for wash up, mopping up spills, the thicker ones are great for putting hot saucepans on so they don’t mark your counter. For facecloths I use a bamboo and cotton mix yarn so they are softer. You can just throw them all in the wash and they come back out perfect. I must admit I was a sceptic before I tried them but now I’d not use anything else lol. This entry was posted in Uncategorized and tagged Dishcloths, Harry Potter. Bookmark the permalink. 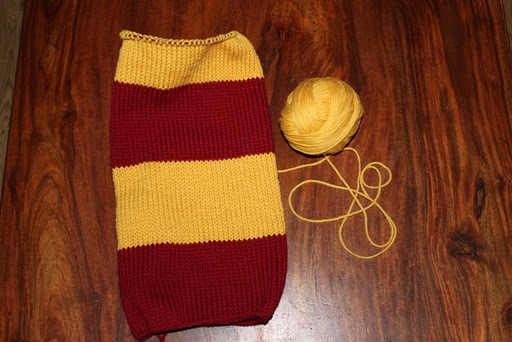 The Gryffindor scarf is looking good. I wonder if one done in crochet would be acceptable by my 9yo grandson who is a huge Harry Potter fan? I agree with you about the dishcloths – they're fabulous and so much better than those yukky sponges. Knit, knit, knit away there :-)The scarf is coming along nicely!I had always bought dishclothes – must try this out sometime! And dishcloths are fun to knit! Love the scarf; I'm thinking I may need to add one to the list for my brother for Christmas. I love your bamboo cotton suggestion! When things calm down after the holidays, I will have to try that out. Those colors are poppin' together! That'd be a great scarf for Chinese New year also.